Mike has been in the construction industry since his teen years. He started out working for his father’s residential construction company before becoming a partner. 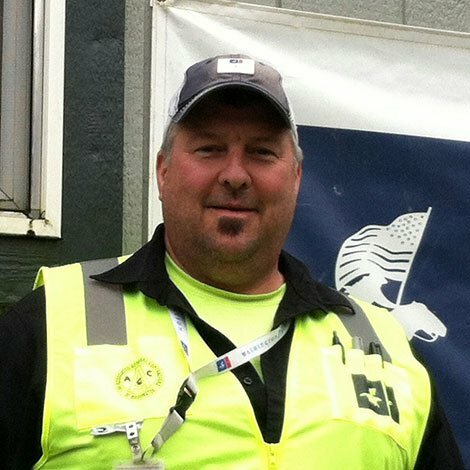 When his father decided to retire, Mike chose to join the Carpenters Union and worked for Wade Perrow Construction before joining WA Patriot. Mike serves as both Superintendent and Site Safety Officer. On WA Patriot’s federal projects, Mike serves as SSHO, responsible for implementing and ensuring adherence to government safety requirements as well as WA Patriot’s safety policy. In this role, he has gained invaluable experience in safety practices and provides input on WA Patriot’s safety policy. Mike enjoys the challenge of working on unique projects that provide the opportunity for him to learn something new. One of his favorite projects was the Fur Seal Observation Towers project located on St. Paul Island in the Bering Sea. Weather conditions made for an extremely challenging project, which he says combined with the uniqueness of the project made it an extraordinary experience. When not swinging his hammer or monitoring jobsite safety, Mike enjoys skiing, motorcycles, working on his two Landcruisers, golfing, and music.